Taking a shot near Dwight Howard is a good way to get blocked. At just under seven feet, Dwight is not only one of the tallest players in the NBA, but also one of the most athletic. He looks like a superhero on the court and has even earned the nickname Superman. It helps that he likes to dress up like Superman, as he did when he won the 2008 Slam Dunk Contest. Dwight has been named Defensive Player of the Year three years in a row, and a big part of what makes him so good is his ability to block shots. When you block a shot, you knock it out of the air so that it will not reach the basket. When some players block a shot, they say they rejected it. 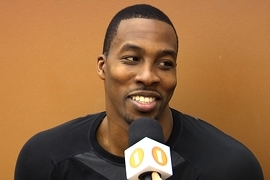 But when we met with Dwight after a recent practice, we learned he likes to use different slang for blocked shots. We also learned about his favorite thing to do when he visits China, besides speak Chinese. Jason: Welcome to English, baby! I am Jason here with Dwight Howard. What’s your favorite way to talk about a blocked shot? What’s the best slang for it? Dwight: Usually, when we block shots, we say, “Yo, did you see what he did? He beat it up! Oh he beat that ball up!” Or we say something like, “Yo, you look like you playing volleyball out there with the ball.” Just something like that, something crazy. “Beat it up” or “It looks like he’s playing volleyball,” something along those terms. Jason: You’ve been in China several times. Jason: That’s great, man. Is there something you like to do when you go to China? Is there like a place you go or a food you eat every time you go? Dwight: McDonald’s. They have the best chicken wings I’ve ever had in the world in China. The chicken wings are so good. They’re spicy. They’re amazing. And then they have the old-school fried apple pies. When I go to China, I gotta go to McDonald’s. The Skittles taste different over there and I love ‘em, so that’s what I do when I go to China. Jason: Wow, you eat foods that you would normally have here, but they taste different over there. Dwight: They taste different. They taste better. They taste a lot better. It’s hard for me to walk down the streets in China. But the mall is fun. Going to the mall, like the eight-story mall. It’s crazy. I love it. Jason: You get recognized a lot though? Is that what you mean by it’s hard for you to walk down the street? Dwight: Huo hua de! Huo hua de! Superman! Superman! It’s crazy. Jason: Awesome. Thanks so much for talking with us. When he blocks a shot, Dwight Howard doesn’t like to say he rejected it, like most players do. He likes to say he beat it up. He also compares blocking shots to volleyball, a sport in which players hit a ball over a net with their hands. This language may seem strange, but it makes sense. If you beat something up, you damage it by hitting. If someone threw rocks at your car and dented it, you could say they beat it up. People get beaten up too. When someone loses a fight and has been physically injured by another person, you can say they got beaten up. Dwight visits China regularly. When he goes there, he likes to eat American foods and candies. He says they taste different in China and sometimes you can get old-school items there that they don’t sell in the US anymore. Do you have a nickname? How did you get it? What do you like to do when you visit another country? For more with Dwight Howard and other NBA stars, visit our blog. I got a lot of nicknames. everytime I moved to another city and made new ftiends, they always gave me one. but when they called me with my nickname, I felt closer and more familiar. when i visit another country, i would like be a guest of a native family and live with them if it’s possible. then i can know the differences of life style and thinking between their country and mine. he is the best in blocking shots in basketball. i’m the second child in my family,so my friends ofen call me’xiao er’. i’ve never been to another country, but if igot a chance to another counry, i’d like to eat the food ,visit the wonderful places. I have several nicknames. My closest friends and my parents have given them to me. When they call me with my nickname, this feels very familiar. When I travel I like visiting special hidden places that only inhabitants do know as well as famous places. I prefer to talk to the native people and to get to know their points of view. I enjoy good meals and the wonderful nature. Well, I have some nicknames, but the special one is MORENA, which means BRUNETTE in Portuguese. Well, when I travel I like trying the typical food and visiting not only the hot spots, but also places native go… I think it’s better to do that if you want to get the local culture! Dwight Howard is an interesting character. he is good at beating it up. Snoopy, back to Olympics in China, Michael Phelps was recognized in the streets as well as Dwight Howard and was dubbed by locals as a ‘fish’.